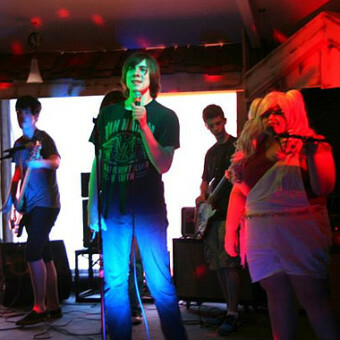 Kids and teens in pop and rock bands… a craze that is rocking the nation! If you want the best Rock School program around, as a student of DeAngelis Studio of Music you are in the right place! Mike DeAngelis established his Youth Bands Rock School program in 1996, well before everyone else, and is the master at it. DeAngelis Studio of Music students have the opportunity to audition for existing or new Youth Rock School bands and Pop Groups. They learn how to work as a group, choose great songs, run rehearsals, put together back-up vocals, and get the most out of their time on a big stage with a real sound system. Mike DeAngelis, a seasoned professional with over 20 years experience in the industry, will teach you the tricks of the trade. Meetings are once per week for 1 hour rehearsals, or 1-1/2 hour rehearsals, and run in 10-week sessions. A cool “gig event” rounds off the session on or near the end of the 10th week. Most bands decide to keep going… we have bands that have been together over 5 years! Our more advanced bands go on to work on original music, which can include professional recording and songs on iTunes!! If you aren’t quite ready to join a band, why not consider joining our jam sessions? Get a feel for what it’s like in a group setting, jam with fellow artists, and have some fun. What are you waiting for? Join the best music school in New England! !